You just moved into a house that has Corian counter tops in the kitchen. Or Wilsonart solid surface, Staron, or another brand. And the cabinet doors have old ugly generic chrome handles which are better suited for a roadside rest stop. 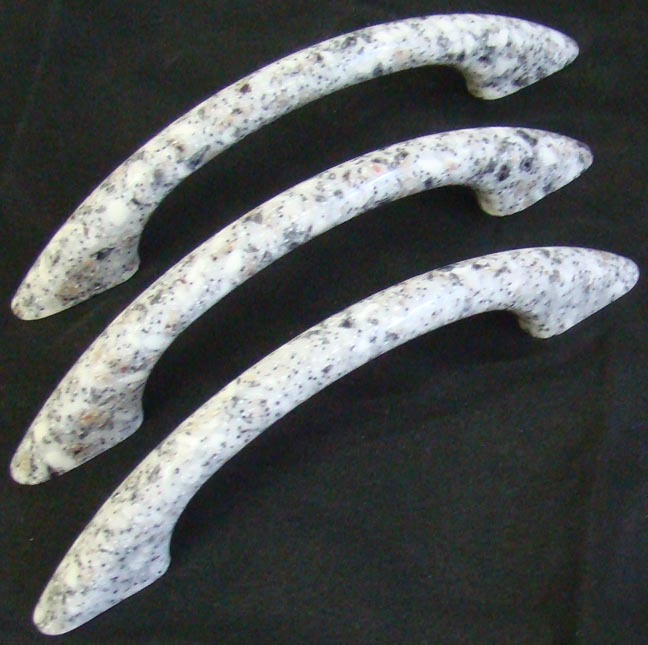 If you would like a change, and something that will match or potentially matches, check out the solid surface handles from Rock Solid. Corian and other brands have continuously added to and deleted colors over the years. In older kitchens or bathrooms, there might not be an exact match available. But since there are many similar color groupings, you may still find a close enough match. Now of course if you have a more modern and still available color, you are in better luck. If you know your color name, the odds of matching are much better. There are fully solid surface handle designs, and several that have complimentary metallic accent pieces. Those with metal accents come in multiple sizes. For pre-existing drilled holes, measure the center to center to order the right size. If you have a really odd ctc, there are two manipulation tricks that can help when the measurements are just a little bit off. Now, if you are building a new home or remodeling a kitchen or bathroom, the ctc measurement may not matter as you may not have any screw holes drilled into your doors or drawer fronts. 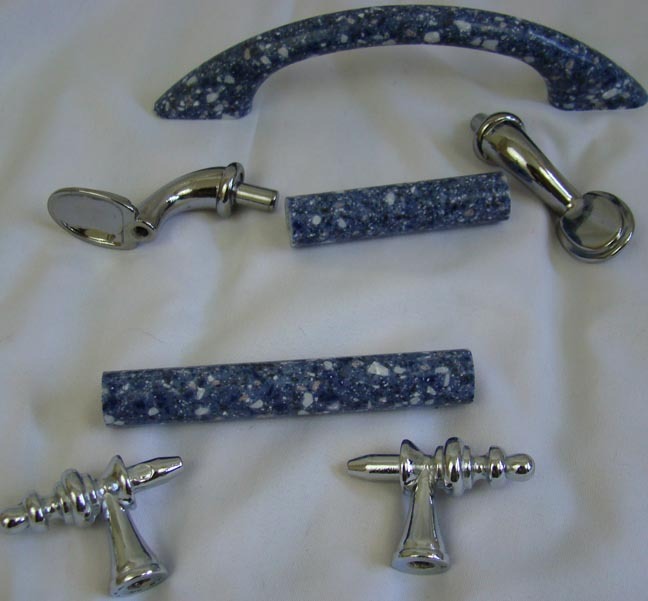 And if you have left over scraps of your solid surface color, and Rock Solid by chance does not have any of that color available, we can have you send your sizable scraps to them so you can have handles and knobs made to match. Note: the 10xx Series is no longer available with 26D brushed chrome ends. You can select from the other 3 metallic finishes. Combinations. Select your solid surface color and your metal accent color. You can make various combinations. The three styles of handles that come with the metal accent pieces are 3-piece handles. They will be shipped as 3 pieces within protective plastic wrap. When you mount them to your door and drawer faces, your screws will hold them tightly together. No need for any adhesive. As you can see above, the feet have thick pins that fit inside the ends of the solid surface spindle. This is how you are able to have multiple sizes with these three handles designs. The solid one-piece handles have embedded threaded inserts that the screws screw into. Note: measurements listed in this chart above are center to center (ctc) measurements for the pulls, not overall lengths. Some overall lengths are noted in the black and white diagrams higher above. In the black and white specification diagrams above, product code numbers are noted. Please enter the prefix: ROC-, followed by the code number, and then end the part number with the color BRAND and NAME, and metal accent color for certain handles. For example: ROC-1040-Corian flint.26. On several cabinet pulls, you will need to note a metallic finish color for the bases.